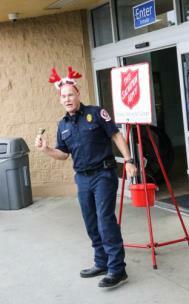 Chances are you have probably seen Lt. Shawn Damon of the Whitfield County Fire Department around town. You just may not have realized it was him. You see, Damon is a man of many faces when it comes to serving his community. If he was helping battle a blaze, for example, his face could have been covered by a breathing mask. Then again, you may have seen him standing outside a local store during the recent holiday season, standing there with a Santa cap on his head and enthusiastically ringing a bell to raise money for the Salvation Army. On the other hand, many local students know Damon only as “Kee-Kee the Clown,” the zany leader of the fire department’s Clown Posse that has been educating kids about fire safety for nearly two decades. Now, the 21-year veteran of the fire department has added yet another face – that of being the county’s Employee of the Month for November. Beaudoin praised Damon for his efforts with the Clown Posse, pointing out that he helps construct and maintain all of the extensive props, scenery, costumes and presentations and oversees the other fire department personnel who help with the annual program that visits students at 13 elementary schools every fall. To allow local residents to get to know his many faces better, Damon filled out the following fun questionnaire. Time with the county: 21 years as a full-time employee but eight years before that as a volunteer firefighter. Where I went to high school: Western High School in a small town called Russiaville, Ind. My role as a county employee: To oversee the day-to-day operation of my shift at the Whitfield County Fire Station 4 and to help my crew come home safe each day. What keeps my job interesting: The fact that every day offers a new challenge in this position, my day is always interesting. If not from the calls we respond to, it’s from being with the crew I’m assigned with. They always keep me on my toes. What gives me a sense of accomplishment on the job: I would have to say watching the new firefighters grow and learn, and to feel that I have had some impact on the way they do their job. Some of the new guys coming in, I have known most of their lives so to see them excel is a good way to feel I have accomplished my job. The most important thing I’ve done on the job: I would like to think the most important thing I have done on the job is that I changed the way fire safety was taught in our school system. Prior to 2001, we just took the fire truck to the school, showed a safety video, and let the kids climb on the truck. But today we do it a lot different with the fire safety show, and every year we try to change it up so it’s always entertaining and never gets boring and all the firefighters that help really enjoy doing it. Where I grew up: Kokomo, Ind., until 1985 when I moved to Boston, Mass., for a couple of years before moving to Dalton in 1989. Family: Wife Sharyl and four children, Tim, Ashley, Zack, and Abby. After work, I like: To relax at home in front of a warm fire or ride the roads on the Harley with the wife and friends when the weather permits. Community activities: Let’s see, I like to stay busy helping with kids or raising money for local organizations. It’s hard to recall the different activities that the fire clowns have been called upon to participate in, but the ones I can are the Home Depot safety day, the veterans parade, the Christmas parade, the boot drive, just to name a few. After 18 years dressing like a clown, you tend to forget a few. Favorite TV show: American Pickers. I like seeing the places they go, and it gives me road trip ideas. Favorite sport/sport team: College football. As far as favorite team, let’s just say it’s not the color red or orange. I am more of a blue and gold fan. Favorite meal: Anything out of the ocean and fried. You can pick four people to have dinner with (anyone from any time in history) – who are your four people and why? My great-great uncle Emil Beavers because he was very interesting to learn about. He was a test driver for the Elwood Haynes automotive and is credited as the first test driver of a manufactured automobile in the United States by the Smithsonian in Washington, D.C., and when electricity was brought into downtown Kokomo and the street lights were installed, all 12 of them, the switch was located on his front porch and he had the job of turning them on and off at night. My friend June Capehart. He was an elderly man that lived across the street that I just met two years ago, and I would sit with him and drink coffee when he was feeling well and he would tell me stories of growing up in this area and his time overseas in World War II. I loved hearing them and we just lost him this fall and I still had a lot to ask. Lyndon B. Johnson, just to ask who was on the grassy knoll lol. And Robin Williams. He just had so much energy and so many personalities. I’m most proud of: My kids and the young adults they are turning into and the choices they are making. Cats or dogs? I love both dogs and cats, but if I have to choose, I would say cats because they are not fake. If they like you, they lay in your lap and if they don’t, they mess in your shoe. Cake or pie? I am a cake person, and there is no such thing as too much icing. Host or be hosted? Love to host and for any reason. If the summer is here, the pool is open. Favorite vacation ever: That’s a hard one. We just got back from a Canada motorcycle trip that was great, but our Key West motorcycle trip had a lot more surprises in it with a secret wedding planned. Best teacher I ever had: No brainer. Mrs. Linton, my fourth grade teacher and not just because she is now my mother-in-law. Pet peeve: Not finishing something you start or not giving 110 percent. Who has had the most impact on my life: I like to think I take a little something from everyone I meet and apply it in my life. I have a lot of great friends in this department, and we all lean on each other at one time or another. But if I had to choose just one, it would be Battalion Chief John Chester. Having him as a friend coming up in the ranks together and then to have him as a battalion chief was a great experience. To see how he treated his family and to see how he treated his men was to see that he treated us as family. What’s left on my bucket list: Well, I am working on it. We have ridden from the most southern point to Canada, and I have flown a plane. Next is to ride east to west and jump out of that plane. If I could have been in any profession of my choosing, I would have been a: I love what I do with no regrets. My grandfather was a fireman, my uncle was a fireman, and my father was a police officer (guessing he couldn’t pass the fire test). If I could have two wishes, they would be: That when I am gone, I won’t be forgotten and for a cure to cancer. You’d be surprised to learn that: Growing up, I was quite shy and could never speak in public.